On Wine and Gender: Chambertin = Masculine. But Why? – GARGANTUAN WINE. It’s worth asking why. 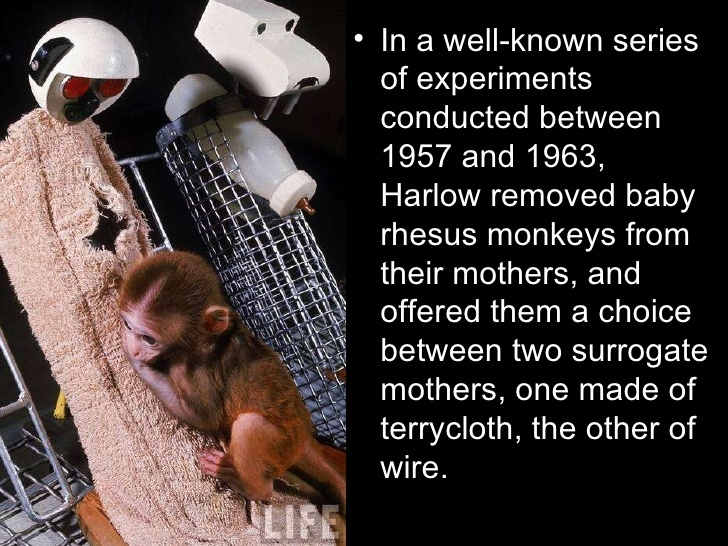 And Harry Harlow’s historic cloth and wire mother experiment may offer a clue. Harry Harlow is a man tormented by baby monkeys in Hell. Image courtesy Damian Gordon, ‘Wire and Terrycloth Mothers’, Jan. 2011. CC BY-SA 4.0. This would suggest there is a biologically hard-wired equating of “supple” and “caressing” with mother, and by extension female. If we are driven to characterize wines which are “supple”, “silky” and “caressing” as feminine, it may in part be due to this predilection. But, getting back to masculine wine: any wine with coarse tannins not meeting these criteria is unceremoniously dumped into the masculine category. In addition to coarse tannins governing whether a wine is perceived as masculine, there is also our curious penchant to attribute masculinity to a quite a few aromas: graphite/earth, tobacco, and leather/smoke. These terms most often accompany tannic wines described as masculine, and one can’t help but wonder if these aromas aren’t somehow inextricably bound to tannins — perhaps even on a chemical level. We’re going to examine two of these aromas: tobacco and leather (I would have loved to investigate the graphite/earth aroma, but simply finishing this three-article series in its current form required over six months). Something to bear in mind: masculinity is a tenuous status, which must be proven again and again. As many of the following activities remain intertwined with masculinity to this very day — and help men prove their manliness to themselves and hopefully others — it’s easy to decipher the cultural stereotypes. Circa 1958. 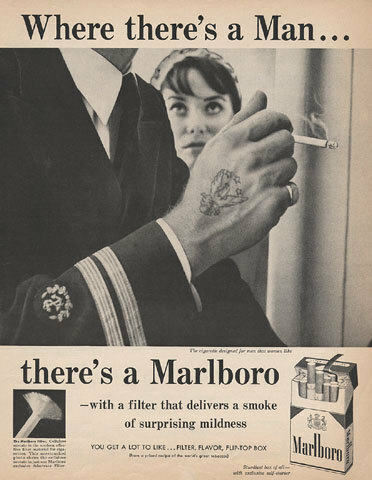 The military tattoo was used for many years in Marlboro ads. That tobacco should be considered a masculine aroma is an iteration of “masculine is what masculine does”: and Victorian smoking rooms would seem a fair starting point. So let’s test my assertions as they relate to wine. If, as I observe, A) tannic wines from highly tannic grapes are most often perceived as masculine, and if B) tobacco is viewed as a traditionally masculine aroma, then it shouldn’t surprise us if C) most wines showing tobacco aromas are the product of extremely tannic grapes. Leveraging CellarTracker’s database of tasting notes4 substantiates the notion. 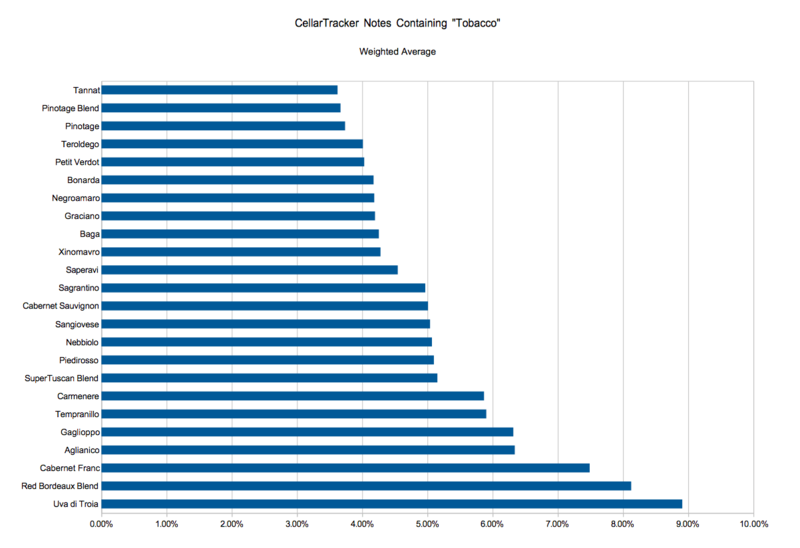 The following graph shows the largest clusters of notes containing the word “tobacco”, sorted by varietal. And, lo and behold! We’re left with nothing but fiercely tannic grapes. Pinot Noir and Syrah drop out of the picture. Who knew Uva di Troia (aka. Nero di Troia) would beat out Bordeaux blends, Sagrantino, and even Tannat — Tannat, the variety I would’ve bet the farm on! 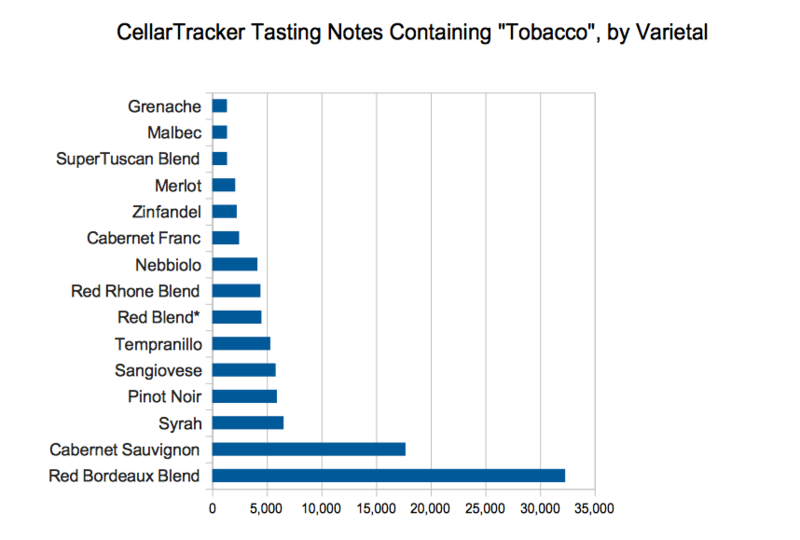 Nearly 9% of all CellarTracker tasting notes on Uva di Troia use the word tobacco. Just as with tobacco, the leather aroma is most often used to describe wines made from highly tannic grapes. First and foremost are red Bordeaux blends, but other popular citations include Syrah, Sangiovese, red Rhône blends, Pinot Noir, Tempranillo, and Nebbiolo. You might suspect — as I did — that leather aromas in wine are traceable to a single family of compounds in wine. And, like me, you’d’ve thought wrong. “No particular compound is currently known to specifically generate a leathery odor. It may in fact be the joint, qualitative attribute of a series of compounds. To add to the confusion, the term leather seems to be used in two distinct ways: one negative, usually in association with Brett odors; the other positive, in connection with the aged bouquet of red wines. Ethyl phenols (produced by Brettanomyces) have typically been ascribed as possessing a wet leather aspect. Other researchers refer to ethyl phenols in association with a complex of compounds potentially associated with Brett off-odors, such as Band-aid, burnt plastic, smoky, phenolic, clove, wet animal, bready, barnyardy, horsy, horse sweat, medicinal, tobacco, and putrid. Any association between a smoky attribute and leather is probably due to the correlation between these terms being used to describe the off-odor attributes of ethyl phenols. In addition, leathery might be a qualitative attribute of the new series of aromatics termed polysulfuranes 7, described as having flinty characters, which some people have associated with smoky. So: wow, what a trio we have here; tobacco, leather, and smoke! Marlon Brando, The Wild One, 1953. And to think it may all just be tannins — or more precisely, different expressions of tannins over time. But exactly when did gender creep into wine professionals’ tasting notes? Who was the first person to call a wine masculine or feminine? All will be answered in the final article on Wine and Gender. Fantastic read; I’m looking forward to part III! You had me at Rob Halford! I am enjoying this series of articles. You’ve inspired me to go back over my own tasting notes to find my use of terms that may be gender influenced or indicators of gender. My intention is not to browbeat or shame anyone here, but instead to lift the veil on these invisible assumptions that have permeated our thoughts for so long without ever seeing the light of day or critical scrutiny. alternative, since the filter kept the paper and tobacco flakes off of lipsticked lips. 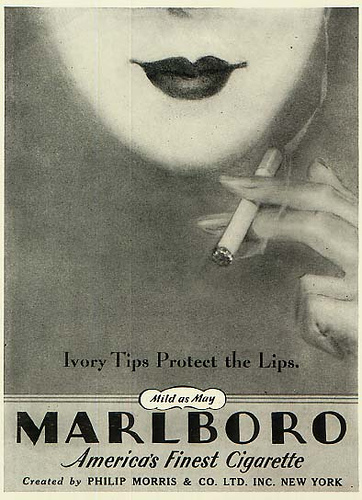 Marlboro, dating back to the 1920s, was originally positioned as a women’s brand. Repositioning the Marlboro brand as a “masculine” smoke (and the best-selling cigarette brand) in the 1950s is a legend in the annals of advertising and marketing. Interesting. Check out the WHO research paper I linked to that served as my source. Will have to read this more closely later when I am free at home! However, this is inaccurate. Marketing/targeting women as consumers existed at least as early as the late 19th century. Thank you for pointing this out, Robert Schneider! Amazing. Two visually compelling proofs. I must confess I am fascinated by the history of cigarette marketing. There’s something positively demonic about a baby insisting on a brand of cigarettes to his mother. Did you know that there is a similar origin story with Old Spice? originally for women, before being repurposed into one of the most enduring scents of our time.